All versions of Call of Duty: Modern Warfare 3 are being developed side by side, says Infinity Ward. Infinity Ward's creative strategist Robert Bowling says that the studio will not focus on one platform over any other for Call of Duty: Modern Warfare 3. Responding to a question on Twitter, Bowling said that all platforms were developed alongside each other, ensuring that everyone had a positive experience with the game. Activision came under fire following the release of Call of Duty: Black Ops, with players on the PC and PS3 complaining that all of developer Treyarch's resources seemed to have gone into the Xbox 360 version. In his response, Bowling hinted at these complaints and explicitly stated that the Xbox 360 and PS3 versions were the same. 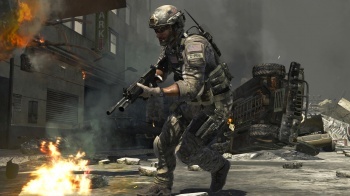 He did admit though that the PC version would receive some unique optimizations, something that will no doubt please PC players, after the upset caused by the decision not to include dedicated servers in the previous Modern Warfare game. Bowling also claimed that Modern Warfare 3 would use every scrap of disk space available to it - including the extra 1Gb afforded by the recent Xbox 360 firmware update - and that the game's frame rate would be capped at a minimum of 60 fps on consoles, although he said it could go higher at times.